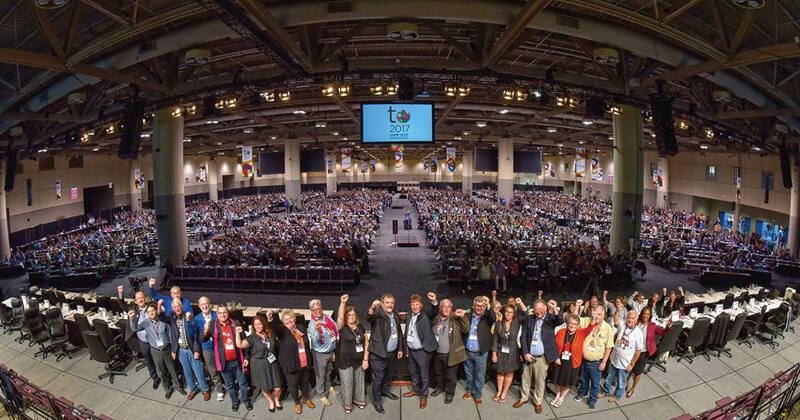 Last week at our National Convention in Toronto, 2,200 delegates engaged in debates around our union’s priorities, policies and structure. Working together, much was accomplished. Here are some of the key decisions that were made. Delegates approved a resolution to begin pay for eligible members of striking locals on the first day of a strike, instead of the fifth, as is currently the case. This move will strengthen the position of locals who encounter obstinate and unreasonable demands from employers at the bargaining table. This change to strike pay is effective immediately. Coupled with the union’s renewed bargaining policy, which rejects all attempts by employers to force concessions and two-tier proposals on workers, we now have a full set of tools to take on bargaining in a climate of aggressive austerity. Delegates also adopted CUPE’s Strategic Directions, which establishes the union’s priorities for the next two years. The plan sets out how we will make gains in our workplaces and communities, fight racism and discrimination in all its forms, defend public services, and advocate for a better country and world. Delegates approved a resolution to create a Task Force on Governance which will review the structure of our union as laid out in the constitution. Our governance structure has not changed significantly since our inception as a union in 1963, despite the substantial growth and changes in our membership in the intervening 54 years, and this assessment is long overdue. The task force will look at the current and historic composition of our leadership, the role and responsibility of the positions that make up the National Executive Board, and the structure of our chartered organizations as well as that of other labour organizations. The task force will make recommendations to the National Executive Board by March 2019, and the NEB will submit any constitutional amendments necessary to the 2019 National Convention.